I am writing in a quiet house listening to the hollow plunk of rain and music about love that never ends. A mug given to me by a friend holds a cup of tepid black tea and sits atop a plate with a fabric teabag that feels just like the thin tights of my childhood. It is the last Harney & Sons variety from the box Mama brought back from Paris. This is my right here. And you’ve got your own right here happening where you are (perhaps also known as right there). For both of us, right here is what we’ve been given. Our now mixed with all we are, all we’ve lived. This present moment. The quiet with the clock’s tick keeping time, the brush of eyelashes, the scramble to get out the door, the sunrise like every shade of citrus, the financial struggle, the sick loved one, the sink once again full of dishes, that Love never ending. Sometimes I’m happy to savor what is — like this moment of rare quiet doing something I love — and sometimes I’d rather avoid or escape it. The moments when right here means unresolved sadness or stifling perfectionism or body pain or incessant arguing? Well, then I don’t really want to be right here. I’d like to jump right out of my skin, though that’s probably more painful than I imagine in the moment. Or check out. Maybe check out. Our lives are unique in their details, and yet they speak to collective stories and lifelong searches so much alike in the big ways. Most all of us this world over are doing our best to survive, wanting to know we’re loved and wanted, wondering what this life is for, desiring happiness and safety for ourselves and those we love, trying to be kind. Each of our lives presents different ways to ask and live out the questions, but we’re all doing it one way or another. And I see more and more that the ways I handle the small right here moments informs how I respond to the big out there questions. So, all that’s to say I’ve got lots of thoughts about right here and why it matters. And though I’m not sure exactly what the next 31 days will look like, I do know that I’m committed to showing up, and I’m so glad you’d consider joining me. Perhaps before we get started, I should provide a little background. Each year, a blogger known as The Nester, hosts “31 Days” — an online challenge to write about the same topic for, wait for it, 31 days. This is my first time, and I’m entering into it with equal parts excitement and fear, which seems appropriate as that’s a lot like life. I’m quick to count the good aspects of excited, but I’m learning something about the gift of fear, too. When I’m fearful, I am reminded that I am not believing what is most true, that the great mystery can be terrifying and also beautiful and that I am not in ultimate control. And those are very good things for me to remember, right here, listening to the rain outside my window. I’m so glad to have you on the journey with me. If you’d like to make it easier to follow along, click here to Like Draw Near on Facebook, subscribe to follow my blog on the sidebar at left or follow me on Twitter @AshleyMLarkin. 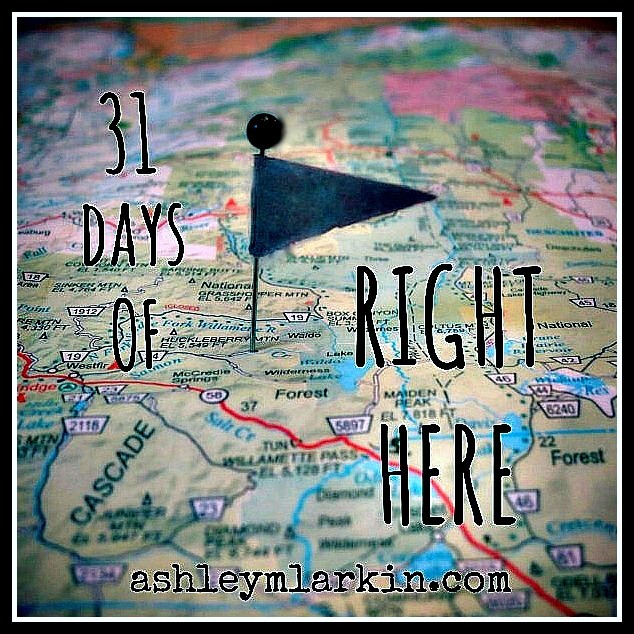 This is an introduction to 31 Days of Right Here. You can click here to see a complete listing of posts in the series, updated every day in October. 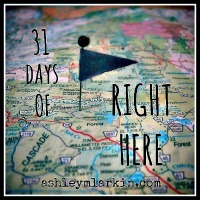 This post is a Welcome to 31 Days of Right Here. Oh my goodness, Karrilee! Isn’t that funny how we imagine others having it together?! No, no, the only reason I had a quiet house and a cuppa today is that I was so woefully behind on my 31 days and had nothing prepared until today. This is a just in the nick of time kinda thing. Thankfully, my mom-in-law was able to take my littlest for a few hours so I could get something done. As I said on your blog, I will be writing in real time with you! I am so glad you invited us to go on the journey with you. Connie, so glad you’re here as a traveling buddy! Hi Ashley! It has been a while since I’ve visited and was excited to see your name close to mine in the 31 Days series! I love your theme, it feels so restful…and purposeful to me. So good to see you!! Hmm, the above comes in as scripturemom wordpress and i have no idea why, maybe I have an alter ego? Yay, Melanie! So happy to see you here! I do hope there’s both rest and purpose in this journey. I’m excited to see what you’re exploring in your series this year. And that tin roof — that’s what my mama has, and it makes such a wonderfully distinctive (and loud!) noise. How funny about scripture mom…who is she? I wonder. What fun it will be to read your Right Here moments and reflections for the next 31 days! I am so proud of you for taking on this endeavor! I know it will bless all of us, your readers, to ponder and reflect on the Right Here of our lives….and as you said, sometimes that is easier than others! I love you, friend. Thank you for cheering me on in this. I’m sure you’ll be hearing ALL ABOUT the process…bless your heart. And I truly do hope you’re blessed through this. So thankful to walk with you. I’m really intrigued by this series topic! Can’t wait to read more!! Thanks so much, Mary. Happy to see you here! By the way, I don’t know if I commented that day, but your recent post on (in)courage touched me deeply. Thank you! Looking forward to following along with the 31 day-ers. This sounds delightfully perfect Ashley. Thank you, Shelly. It was tough for me to hone in, but I think this is going to be good. Can’t wait to check out your post today. Your teasers have had me intrigued for weeks! So very true! Can’t wait to join you “right here” these next 30 days! So happy to have you join me! I love you, Sis! I am experiencing my worst Fm/CFS flare in seven years and believe me to be right here in my pain is such a gift from Pappa for He is truly so VERY close to those who suffer. As the pain and the others symptoms become worse, His grace becomes more and more and my heart is able to fly on the wings of His love, filled with joy and peace. Mia, honestly, you amaze me. To say that your pain (every seven years kind of excruciating physical pain) is a gift — it’s almost too hard to imagine, but for God. Yes, I too believe he is so close to those who suffer. Friend, I am tremendously sorry for what you are experiencing right here, and then again I suppose I can’t be because the love, freedom, joy and peace you describe are those things that all people desire in their lives — more than anything. I continue praying for you. May you continue to know the tender lifting of those wings. 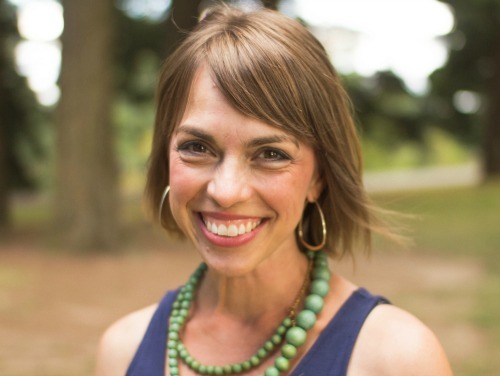 “And I see more and more that the ways I handle the small right here moments informs how I respond to the big out there questions.” Wow – love these words! They’ve given me so much to ponder this morning. Thank you, Ashley. Looking forward to all 31. Thank you, Christie! So happy to have you join me. They’re going to be a good 31, aren’t they, friend? I love you. Grateful for your faithfulness and sisterhood. :-) I have a feeling that rain will make a few appearances this month. How could it not with the torrential downpours we’re having?! Thanks for all your encouragement. Love you, Ma. As someone who sometimes doesn’t want the “right here” I’m a little tempted to pretend this doesn’t speak to me. Buuut, I’m pretty sure it does. :) Thanks for being bold enough to tackle a topic like this! Thank you for your words, Kim. I so understand that place. It’s interesting, having felt the nudge to enter into this adventure, I have no idea just how bold it will require me to be, as I don’t know what each day will bring. Thanks for being along for the unpredictable ride. Wonderful insights Ashley. I always find treasures in your writing, and am looking forward to the next 30 days! So glad you’re joining me, Uncle Don! Love it Ashley. Your topic is timely and relevant for ANYONE living in 2013, constantly contending with distraction and noise and promise of something better just one. more. click. away. This year I’ve embarked on what I call “reclaiming nap times” – tying to find space in my day to actually have margin, room to breathe, create, and it means setting aside my lists for a while. It’s so hard (and so rewarding! ), and it’s helping to teach me how to be in the moment more. Admittedly I still struggle, but I’m finding my way. What a wonderful ministry of words you have. This is going to be an awesome series. Adriel, thank you so much for letting me know this resonates and for your encouragement. Thrilled to have met you through the (in)couraging writers group. You are so right about that “one.more.click.away.” It’s so draining, isn’t it? I’m actually going to be writing about technology some in this series — how it creates a sense of frantic, that we are never just where we are supposed to be and how it can rob us of the right here. I LOVE your reclaiming of nap times. That is so brilliant! What wisdom and discipline to take that margin we all so desperately need. Thank you again for being here! So glad I stopped long enough to do a little catch up on draw near. Really hope to follow you on your new journey :). I’m so excited to savor this journey with you throughout this month, sweet friend. I love, how I love, that beautiful deep and true soul of yours – all its ponderings. I know that as you are focusing on where you are – all the “right here’s – it will help me, too. Your words spill out, all over others, in life and blessing – because they reflect the beauty of God’s heart. I’m proud of you for saying yes to this opportunity.